The Welsh Air Ambulance saves lives by saving time. Here you can see them saving time at a drop-kerb and crossing point for white cane users in Caernarfon. I once saw the London Air Ambulance land in Cambridge Circus — the intersection of Charing Cross Road and Shaftesbury Avenue — and it’s amazing to see how they make such skilled manoeuvres in really tight spaces like these densely built-up streets. I’m sure the disabled, visually impaired, and parents with pushchairs are happy to wait while they perform their vital life-saving duties, and that the lives saved on this mission will justify the smashed paving slabs. The British have a bizarre habit of going on holiday by car, as though rolling down a bland motorway and sitting in smelly smoggy traffic jams to queue for car-park blighted destinations is an attractive way to spend leisure time. Previously I’ve given a couple of suggestions for really simple inexpensive and fun breaks without a car: the Highlands by bicycle and the Lake District by bus. Those are great options for lovers of landscape and wilderness. But what if you have kids to entertain? 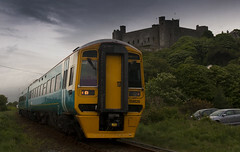 A train passing Harlech Castle (2 for 1 with your ticket) on the Cambrian Coast line. 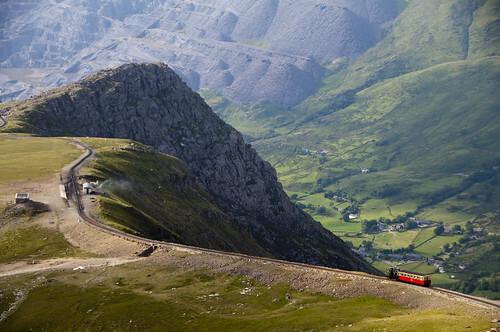 How about taking the train to Snowdonia? Snowdonia has vast sandy beaches; massive well-preserved mediaeval castles; great craggy mountains full of quarries, ruins, and the remains of strange industrial operations; and best of all, it’s full of quirky narrow-gauge steam railways — all things that will appeal to the grown-up kids too. It’s also relatively easy to get trains from population centers like London, Manchester, Birmingham and South Wales. As always, book train tickets a few weeks ahead to get the bargains. Caernarfon Castle: 2 for 1 entry with rail ticket, and conveniently situated at the end of the Welsh Highland line. You can make the whole thing cheaper and easier with one of the best kept secrets of the railways: rover tickets. The “Explore North and Mid Wales Flexi Rover” ticket costs £57 for adults (£37.60 if you have a railcard) and £28.50 for the kids. The ticket lasts for eight days, during which you get four days of unlimited train travel in the region, plus all eight days unlimited bus travel. And if you don’t think that compares favourably to the price of petrol (and buying a car, driving lessons, insurance, tax…), note that it also gives you lots of big discounts on the things that kids (including grown-up kids) will want to do. If you’re spending a week on holiday with kids, you probably don’t want to be moving accommodation every night. You want somewhere stable you can leave the suitcases and come back to at the end of the day. 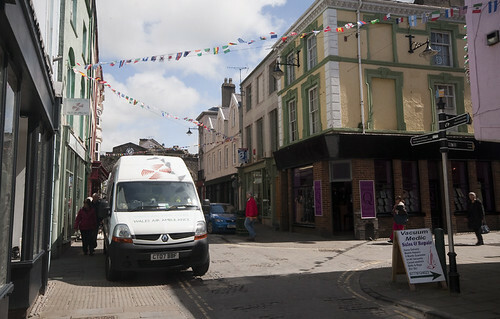 How about Porthmadog? Porthmadog is on the Cambrian Coast Line from Shrewsbury (Shrewsbury is within the rover ticket area and has trains from London, Birmingham, Manchester, Cardiff), and the train journey through the hills — the deep cuttings, high viaducts, and the long bridge over the estuary at Barmouth — is a tourist attraction in its own right. Though a long and slow journey due to the constraints of the line, it’s never a bore. 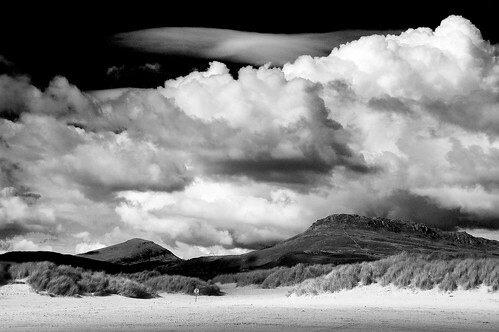 Porthmadog itself has a small harbour and beaches, and is close to the vast beach at Black Rock Sands. It’s also home to two of the most spectacular narrow-gauge steam railways. The Ffestiniog Railway and the Welsh Highland Railway are the longest of the narrow gauge heritage railways in North Wales, they both start from the harbour station in Porthmadog, and they both offer a 50% discount to holders of a Rover ticket (a considerable saving). The Ffestiniog Railway crosses the Glaslyn estuary at Porthmadog and winds up the wooded valleys to the slate quarry town of Blaenau Ffestiniog, with trains pulled by bizarre double-engines. The Welsh Highland Railway briefly runs along the main road in Porthmadog before heading up into the steep sided valley of the river Glaslyn, along ledges high above the rocky river and through a series of rough hewn tunnels, crossing over the mountains in a pass alongside Snowdon itself, and descending again to the Menai Straits beside the castle at Caernarfon. One of the Ffestiniog Rwy's bizarre conjoined twin engines. One of the Welsh Highland Rwy's powerful double articulated engines. There are other narrow gauge railways in the area. The Talyllyn railway, an hour south of Porthmadog on the conventional railway, offers 20% discount to Rover ticket holders. And a short narrow gauge railway runs alongside the lake in the vast old Dinorwic quarries — now the National Slate Museum (free entry with the Rover ticket) — at Llanberis, in the shadow of Snowdon. Indeed, Llanberis, which is just an (free with your Rover ticket) open-top double-decker bus ride up the valley and over the pass from Porthmadog, is home to a variety of weird and wonderful things, from a ruined World War 2 munitions store to the Electric Mountain underground hydro-electric power station. And it’s at the bottom of one of the best railways of all, the Snowdon Mountain Railway, which rises a thousand metres over an eight kilometre line from the lake at Llanberis to the summit of Snowdon. At the top you can buy a cup of tea and sit in the warm, seeing what mountain climbers get to see, but without putting in any of the effort. If that’s not enough to fill a holiday, there is Criccieth Castle along the Black Rock Sands in the next town from Porthmadog, and Harlech Castle in the opposite direction, down the railway to the south — the opposing castles of the medieval Welsh and English. Or make use of the other railway lines that are on your ticket: the Cambrian Coast line down to Aberystwyth; or take the Blaenau line through its long tunnel and down the Conwy valley to the castle at Conwy, the national trust gardens at Bodnant, or to the traditional seaside resort of Llandudno with its tramway, cable car, and pier. 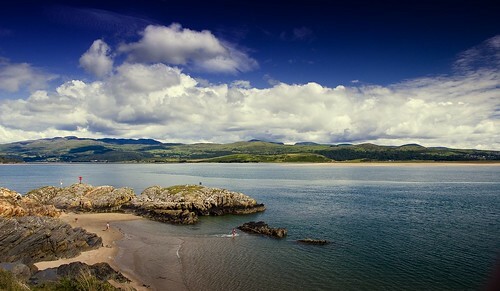 The North Wales Coast line is also accessible from the Blaeneu line, or on the fast bus from Porthmadog, and runs through spectacular scenery and impressive engineering from Holyhead to Chester, via Llanfairpwllgwyngyllgogerychwyrndrobwllllantysiliogogogoch, the Britannia Bridge over the Menai Straits, and through the town walls of Conwy. More photos at my photography site.